Great news! UNIQLO is now offering men’s footwear! 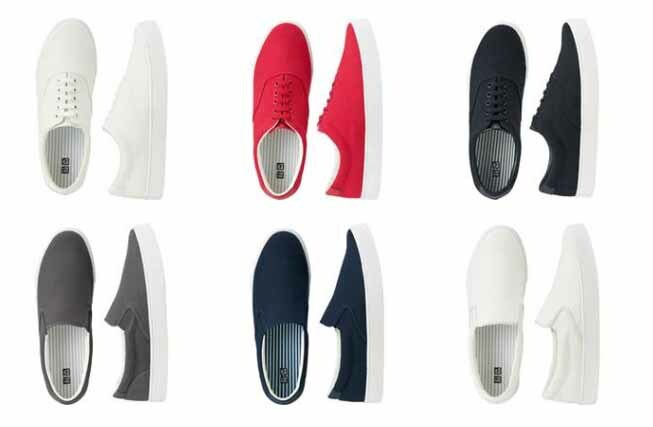 The lineup includes two types of sneakers, slip-on and lace-up in five color variations. Perfect any casual or fashionable situation, these shoes are available in select stores and online in sizes 5-10, priced at an affordable $34.90 (+tax). Cushioning – The shoes offer a polyurethane cup insole that forms to the foot, and consistently provides exceptional cushioning. The material is used in athletic shoes and similar footwear, dampening the shock when walking. Grip – The outsole has narrow slits that enhance the flexibility of the bottom when walking. Raised portions parallel to these slits grip the surface, providing traction for steady walking. Durability – The upper portion is made of heavy-duty cotton canvas, with stitching in the midsole to prevent separation of the outsole and upper. Fit – A sponge material around the opening improves the feel around the foot. The shoe tongue and upper are connected with an elastic band to improve the fit between the shoes and foot. UNIQLO has been expanding its lineup of accessories, including hats, belts, scarves, and bags. The addition of shoes allows customers to fully coordinate their outfit according to individual style and preference. Consistent with UNIQLO’s LifeWear concept, these shoes are functional, comfortable, and reasonably priced.